At the end of a Laser Tag Session, we like to raffle off prizes, as well as give out merit awards. Players will have earned raffle tickets based on the number of points they earned minus the number of times one of their tickets was drawn for Game Choice or to be a Team Captain. Make sure to specify the prizes before the session starts. Mostly cash – usually the adults pool in like 10 to 20 bucks each to create a prize fund. An I-pad Air – which I did not win…grrr! Mini-Cam – which is one of the coolest things I’d ever seen. I think it’s good to have 3 prizes: 2 smaller ones and one grand prize. And we generally limit it to one prize per person. Like I’ve mentioned before, I love the idea of raffling prizes because it keeps everyone engaged, because everyone wants to win as many raffle tickets as they can, and they know they don’t have to be absolutely best player to have a shot at winning a prize. That being said, we do like to award players for kicking some LT booty. *The word in parenthesis is what we write on the trophy base with a fine-tipped gold sharpie. Sorry, not a ton of room to write much on these things. Don’t be fooled by the photo. 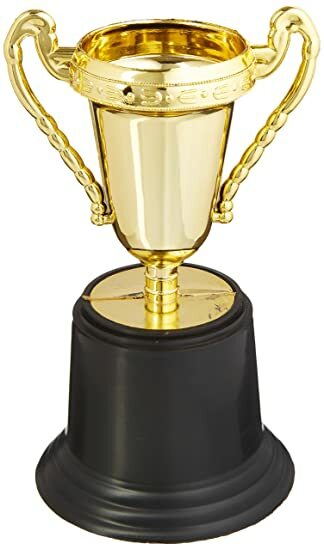 Having prizes isn’t necessary, but I find it gets more players, especially the kids, to stay engaged and have a sense of accomplishment when they win trophies, even though they’re little plastic ones. I find it also helps to build a tradition and something to look forward to at the next family outing. Try it out and see how it works for you and your parties. Feel free to shoot me a comment to let me know your experience and what does and what doesn’t work for you.